The Gladiator is a very popular slide with kids and teenagers alike. The Gladiator Slide can be set up next to your pool or it can be rented with the pool extension where space next to the pool is limited or where it is not safe to use next to the pool. 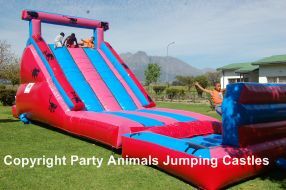 This is a great slide for School Functions as well as Corporate functions and Team Building Events. Bubble liquid or bubble bath can be used to make the slide slippery and at the same time it will create a foam effect. This is great fun! Dimensions: 9m in length, 4m in width and 4m in height. Colours: Red, Spec Blue and Pink. The Gladiator slide uses a 1.1kw motor with a 15m extension lead. If your power point is further than 15m from where the slide will be place, you need to provide an additional extension lead. These are not provided by Party Animals. The Pool Extension for the Gladiator Slide uses a .75kw motor with a 15m extension lead.